an individual’s economic and social integration (Jedwab, 2005). (Carter, Polevychock, & Friesen, 2006). of the parents is taken into account (OECD, 2007). as did children born in Canada (Statistics Canada, 2001). defined standards and objectives (OECD, 2006). sation for Economic Cooperation and Development, 1997). the positive effect of writing skills on mathematic performances. demic achievement and attribution style (Cortes-Suarez, 2005). and extracurricular practices (questions 19 - 20) were selected. enabled us to identify two dimensions: internal and external. on a French paper, it’s mainly because... I was lucky” (α = .68). and failed the writing assessment, according to linguistic group. dents (success: 84.6%; failure: 15.4%). Success and failure levels of the five linguistic groups. = .62; multilingual: M = 2.92; SD = .48). to the other four linguistic groups. ANOVA of internal and external locus of control for each linguistic group. 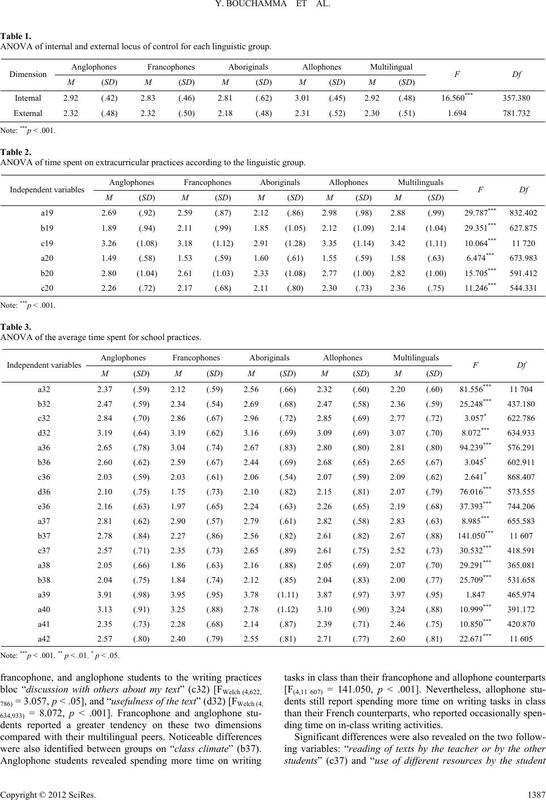 ANOVA of time spent on extracurricular practices according to the linguistic group. ANOVA of the average time spent for school practices. Note: ***p < .001. ** p < .01. * p < .05.
were also identified between groups on “class climate” (b37). ding time on in-class writing activities. ting, and mathematics around the age of 13 (Worswick, 2001). population in order to help them succeed (OECD, 2006). work unrelated to writing outside of class hours. grams with clearly defined objectives and norms (OECD, 2006). cognitive theory. Englewood Cliffs, NJ: Prentice-Hall. M. R. Leary (Eds. ), The social psychology of emotional problems (pp. 37-68). Washington: American Psychological Association. 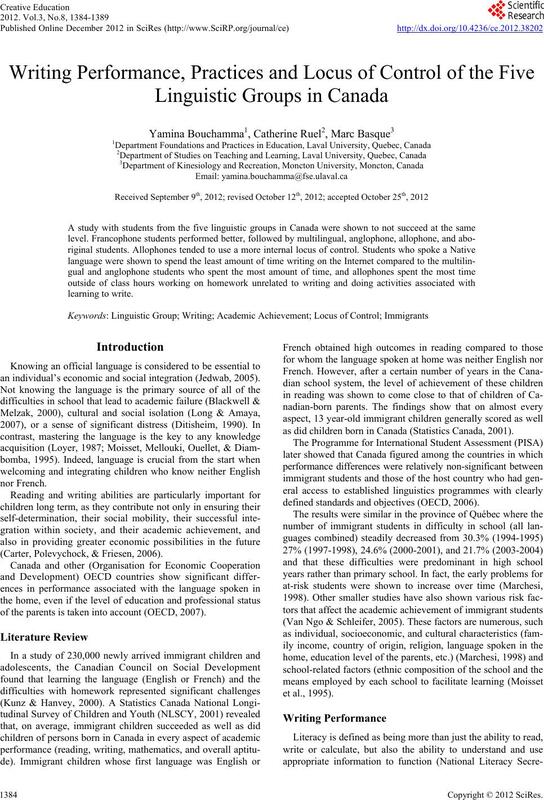 tional Section A: Humanities and Social Sciences, 66, 486.
dren in child care. 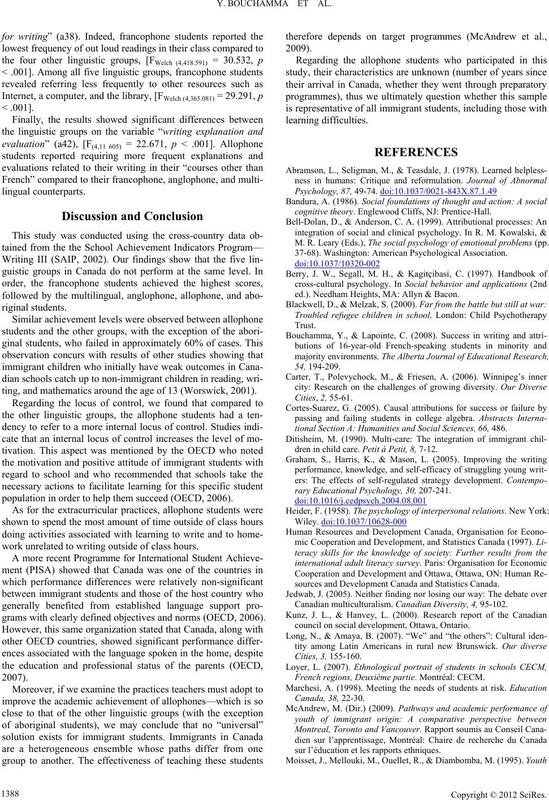 Petit à Petit, 8, 7-12.
rary Educational Psychology, 30, 207-241.
sources and Development Canada and Statistics Canada. Canadian multiculturalism. Canadian Diversity, 4, 95-102.
council on social development, Ottawa, Ontario. French regions, Deuxième partie. Montréal: CECM. sur l’éducation et les rapports ethniques. 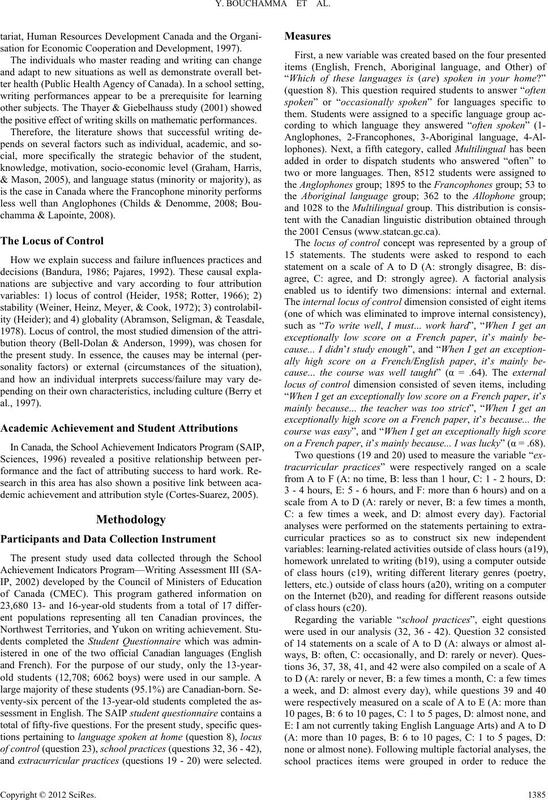 Quebec’s cultural communities and theiracademic performance. vention sur la réussite scolaire (CRIRES). Final report: Teachers matter. URL (last checked 12 April 2008). profile. Ottawa: The Council of Ministers of Education, Canada. nal control of reinforcement. Psychological Monographs , 80, 1-28.
youth (NLSCY). URL (last checked 12 April 2008). math achievement. 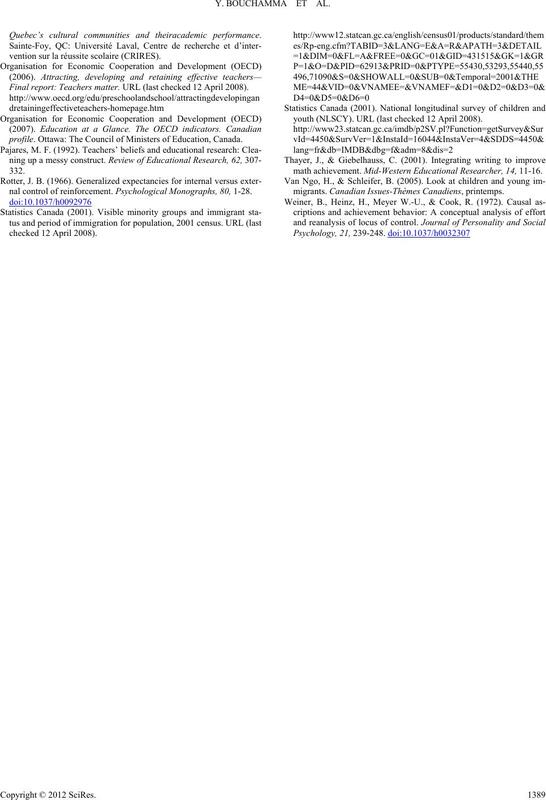 Mid-Western Educational Researcher, 14, 11-16.
migrants. Canadian Issues-Thèmes Canadiens, printemps.